Clip In O.E. 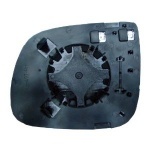 style electric heated replacement wing mirror glass with integral plastic base plate for the Audi Q7 [2009 to 2015]. Clips into the mirror housing as original. [Heated Version].